To view the specials, click here. Escape to tranquility and experience luxury, comfort, and soulful dining at The Christiana All Seasons Resort. We offer 4-star luxury accommodations, as well as venues and services for conferences, weddings, functions, and game drives. Our luxury accommodations have made us a favorite among guests who want spacious rooms with stellar amenities. All our rooms are outfitted with elegant African-inspired furnishings that combine class and comfort. 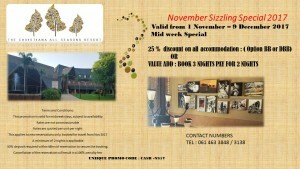 Visit The Christiana All Seasons Resort and experience true South African hospitality. Whether you’re here for business or for leisure, The Christiana All Seasons Resort has the facilities and services to cater to your needs. We offer five distinct conferencing venues that can be configured according to our client’s needs and preferences – from an intimate boardroom to classroom-style or workshop set-up, or even an on-site theatre complete with a stage. For fairytale weddings, we provide arrangements for intimate garden functions or receptions on the restaurant terrace. Speaking of which, our spacious double volume restaurant and terrace has a resident chef and offers African and Western cuisine. There’s also a fully licensed bar that is easily accessible from the restaurant. For those who love the great outdoors, The Christiana All Seasons Resort offers game viewing in our adjacent 1194 hectares game farm, of which about ten kilometers runs on the banks of the Vaal River. Game species include springbuck, kudu, impala, orex, waterbuck, giraffe, zebra, ostrich, and black wildebeest. 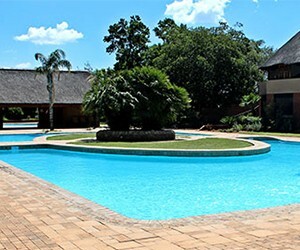 Nestled in a picturesque haven between the quaint towns of Bloemhof and Christiana in South Africa’s charming North West Province, The Christiana All Seasons Resort is the ideal place for leisure and business guests all throughout the year. Christiana is home lovely stretches of farm lands and the Diggers’ Diamond Museum, which showcases the town’s history as a significant diamond hub during the 1870s.